Posted December 8, 2015 . 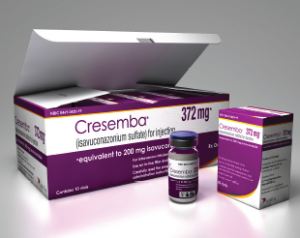 This week, Isavuconazole (Cresemba) will become available in Europe for the first time, following its recent launch in the USA. This is the first new antifungal agent launched for 9 years. It has a broad spectrum, intravenous and oral formulations, is required only once daily and a very good safety profile. Following the FDA approval of this new antifungal in the US in March 2015, the European Commission approved isavuconazole in October, for the treatment of adult patients with invasive aspergillosis and for the treatment of adult patients with mucormycosis, for whom amphotericin B is inappropriate. The European marketing authorization for isavuconazole is valid in all 28 EU member states, as well as in Iceland, Liechtenstein and Norway. It is the newest drug to be registered from the azole family of antifungals – which include itraconazole, voriconazole and posaconazole. Isavuconazole has activity against most clinically important yeasts and molds, including Candidaspp, Aspergillus spp, Cryptococcus neoformans, and Trichosporon spp and variable activity againstMucorales spp. It is also very active many rare pathogens including those that cause chromoblastomycosis. Its drug interaction potential appears to be less than other azole antifungals which may prove it to be useful where drug interactions are problematic. Isavuconazole was developed by Basilea and Astellas.